10 | August | 2010 | Through the seasons before us..
Let’s concentrate on the league..
Thornhill becomes the unlikely first Forest goalscorer of the season! A combination of typical half-job Forest away from home, a bit of bad luck, some spirited opponents and Shilton-reborn in goal for the hosts sees Forest cup campaign over no sooner than it had begun. With five players – four first teamers – missing through international call-ups, it forced Billy into numerous changes before we even consider injuries. That’s not to take anything away from the home side who responded positively after Peter Taylor gamely made all three of his substitutions at half time, and from just before the hour mark certainly took the game to Forest. The Reds continued to make chances – but, alas, it wasn’t to bear any fruit. I think I’m right in saying that Dele as a late option when chasing a game is yet to prove effective. Or something along those lines – obviously with a reasonable amount of swapping and changing in midfield. The game started pretty openly, and Thornhill provided an early warning after call work from Cohen and Anderson lead to the youngster volleyed just wide from the edge of the penalty area. At the other end former-Stags striker Jake Speight was in a dangerous position, shooting from just outside the six yard box only for Lewis McGugan to throw himself in for the block. Back on the attack, Lewis played a lovely throughball to Tyson whose run between two defenders saw him through on goal – only to see his effort saved by Jon ‘Shilton’ McLaughlin. An eventful spell in the game for McGugan culminated in a decent curling effort from 30 yards, however it wasn’t too troublesome for the Bantams keeper to save and hold. It wasn’t long to wait ’til the Reds could break the deadlock though – Cohen turned and put in a decent cross which found Thornhill who’d made a cracking run to unleash a volley across goal. Forest had a good spell from now ’til half time – some nice play between Cohen and Thornhill culminated in a decent effort by Moussi from twenty yards, but it was just over the bar. That pretty much heralded the half time break with the Reds looking relatively comfortable, but in possession of only the one goal lead, of course. As mentioned above, Peter Taylor opted to use all three of his substitutions at half time – and had clearly told his team at the break to get stuck in more and stop giving the Reds so much time on the ball. That said, Forest did start the second half well – Tys attempted an overhead kick which didn’t quite work, but it caused mayhem in defence ending up with McGugan who struck well – only to be denied by the feet of McLaughlin. Shortly after the ‘keeper was on form again to deny Tyson after Paul Anderson had worked well to get him the shooting chance. After a disappointing game against Burnley Tys seemed eager to prove himself, a great turn saw him with another shooting chance but this time it was off target (although not far off target). Then came the suckerpunch – having either been denied by the excellent McLaughlin or missing their chances, Bradford capitalised when Luke Chambers played a ridiculous backpass behind Lee Camp, a three-way race between Camp, Lunch and Speight ensued – it was the Bradford striker who won the race, and ultimately it was Syers who scrambled the ball home to equalise for the home side. This really picked up the home team, and they continued to attack – Wes needed to dive in to deny Moult. Billy must’ve looked down his bench and cursed his lack of depth – forced to field the carrying-a-knock Dexter Blackstock, and Dele Adebola who replaced Anderson and McGugan. I don’t like to be mean, but Dele coming on when we’re needing a goal just screams ‘game over’ to me. I’d love him to prove me wrong. Forest did make further chances – Tys compounded his bad luck by seeing a shot that finally defeated McLaughlin rebound from the post, McCleary was close to getting onto the rebound but Duff was on hand to get the ball clear. The Reds kept on pressuring, but with little end product – and despite being injured the Bradford keeper was still able to deny Thornhill and Cohen as extra time loomed large. So, extra time – the Reds started positively, Tys had a decent effort from the edge of the box but it was just over the bar. Matty Thornhill was close too – but put his shot wide after Cohen’s cross picked him out in the area. Of course, it was never going to go all our way though, and Bradford were awarded a freekick after Joel Lynch hauled down a home player. It was a decently struck effort by Ramsden which was well saved by Camp, a complicated rebound ended up with Hanson putting the ball in from close range to give Bradford the lead, and ultimately of course, the tie. McKenna – another player carrying a knock – was brought on for the clearly-suffering-with-cramp Lynch, which saw a reshuffle putting McCleary at rightback and Chambers at centreback. The home side continued to press – Speight turned brilliantly to get beyond both Chambers and Morgan, but the shot was ultimately a let down (or a let off), giving Camp an easy save. A rare dangerous corner from Forest ended up with Chambers looking like he’d scored but for yet another excellent save from McLaughlin – the final chance falling to Blackstock whose shot gave the Bradford ‘keeper his easiest save of the night. All in all, a very familiar tale – we certainly had chances, or opportunities to make chances. Final balls, shots, a bit of bad luck (woodwork) and some awesome goalkeeping denied us. I guess that makes it not a disaster really – certainly we aren’t the first team to get knocked out early by a lower-league team, and life goes on. Frustrating though, isn’t it? I hope I’m writing something more cheerful come Sunday evening. 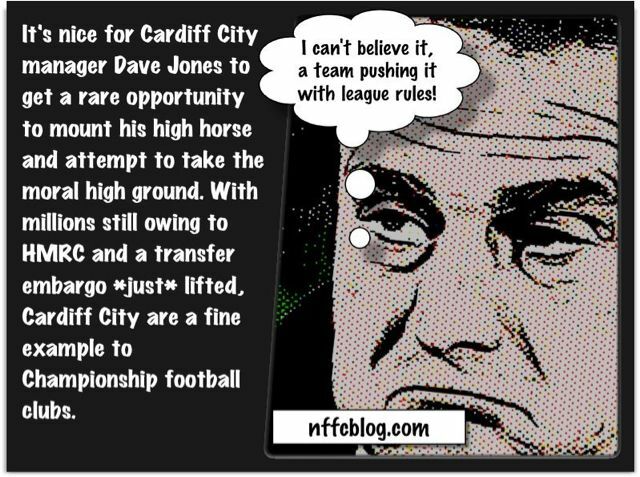 I have some sympathy with Swansea’s position in the unholy love triangle we seem to have found ourselves in, but anyone from Cardiff attempting any kind of moral high ground seeking does rather take the biscuit!